AMD Ryzen Threadripper processors will be launching within 48 hours (depending on where you are in the world) on August 10th and we have what will probably one of the last leaks of the bunch. 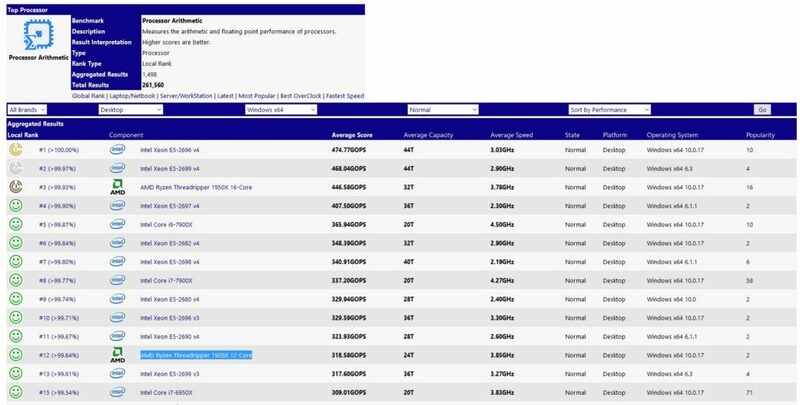 The final Sisoft Sandra score of the Ryzen Threadripper 1920X has been leaked in all its glory and features the full 24 threaded performance of AMD’s large chip. This leak comes after we have already seen the Ryzen Threadripper 1950x in action as well as the Threadripper Cinebench leaks which covered both the 1950X and 1920X. Since launch is just a few hours away, and the benchmark is fairly recent (and most importantly the performance is actually up to the standard we would expect from such a chip) this benchmark can be thought of as fairly indicative of real world performance. The processor is clocked at an all-core speed of 4.0 GHz, which is fairly decent for a 12-core part. The motherboard in question is the ASUS Zenith Extreme. The three areas that the Threadripper 1920X was tested in are Arithmetic, Multi-Media and Cryptography. As you can see in all three areas, the Threadripper 1920X shines. In processor Arithmetic, the 1920X scores a score of 318.58 GOPs which is the 12th best score of all time. To put this into perspective, up till last generation the only processor capable of achieving this was the enterprise level Intel Xeon E5-2690 v4; a 14 Core / 28 Threads $2099 chip! For less than half the price (the 1920X is has an MSRP of $799) you are getting similar performance on a commercial platform. In the multi-media department, we see that the Threadripper 1920X scores 670.91 MPix/s, which once again is a higher score than the E5-2690 v4. This type of consistent performance is what leads me to believe that AMD is done polishing the performance of their Thread-ripping platform and disrupt the consumer HEDT market and also force Intel to respond in kind. The 1920X ranks 23 in the entire Sisoft Sandra database with this score. Finally, we have the cryptography department. This is one place where the Ryzen Threadripper 1920X performs much better than expected. Not only does it blow away all Intel competition, but it actually scores higher than the Intel 7900X, something it was not able to do in the other benchmarks. With a score of 30.11 GB/s, it takes home the 4th place in the entire world in the Sisoft Ranker. This is truly exceptional performance from the CPU. Keep in mind however, that while Sisoft is an excellent test of maximum theoretical performance, at the end of the day, developers will need to learn take advantage of AMD’s brand new platform for it to truly shine. Benchmark numbers of the Ryzen Threadripper 1920X as provided by AMD. AMD’s Threadripper ‘Whitehaven’ CPUs are going to be landing very soon – on 10th August to be exact and the red giant has stuck true to its colors and introduced them at very affordable pricing. The 12 core / 24 thread part, the Threadripper 1920X, will cost a mere $799. I say mere because the comparable Intel Core i9 7900X (with 10 core and 20 thread) costs $999 as well. 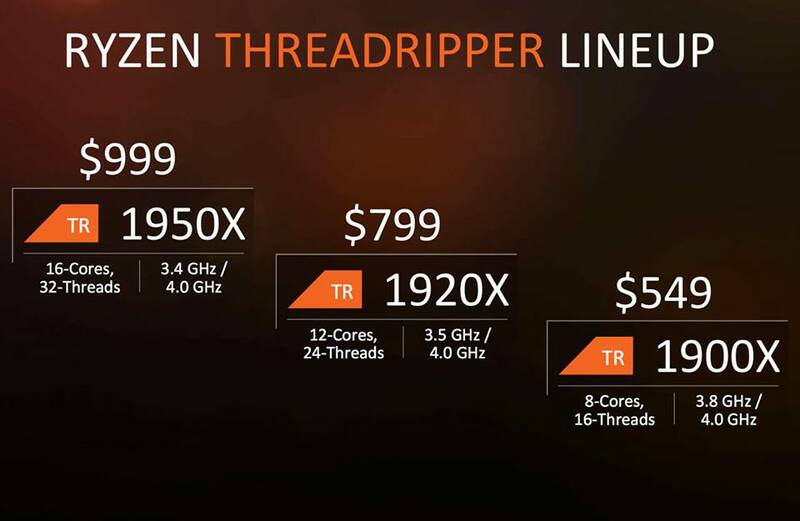 In fact, the Threadripper 1950X (16 core / 32 thread) is priced at $999 and that’s a lot faster than the Core i9 7900x AMD. You can check out official Ryzen 1920X and Ryzen 1950X benchmarks that were conducted on a livestream by AMD. Also, Threadripppaaaaaaah! (Sorry, couldn’t help myself).